What Bible study method do you use? Do you think she silenced the room? I imagine some sat in disbelief, perhaps others in confusion and yet, I’m sure, every lady there must have been challenged by her words. I was challenged, by my Pastor’s wife, as she shared a story about a speaker at a ministers wives conference she had recently attended. The speaker stood up and boldly announced that none of them believed in God’s word and were Bible illiterate. I would have loved to have been there! I’m tired of wimpy, hollow women’s conferences, bible studies and sermons. I want more. I want deeper. I want Jesus! As Christian women, do we read our Bibles with a casual heart? Not really looking at the words, verses and chapters, their meanings, back story or seeing what God wants us to understand and learn? Do we read only the happy verses that fills us with all the “good feelings”? Skipping through the Bible, just looking for something positive for the daily reading? That is not how God intended us to read His Word. We are not called to passively thumb through the Bible. Sisters, how are we to know Christ, walk in His truth, imitate Him and be salt of the earth if we are not diving into God’s word with passion on a regular basis? There are several bible study method’s out there. Find one that is right for you, but I offer you mine, from my heart. R = Read. Intentionally make time for just you, your bible and God. Having prayed first, asking for guidance, start where God leads you. What book of the Bible should you start with? That’s between you and God. Some like starting at the beginning with Genesis, while others prefer starting with the Gospel of John. Just don’t skip around. For example, if you start reading the book of Esther, read the book from start to finish before moving on to another book. 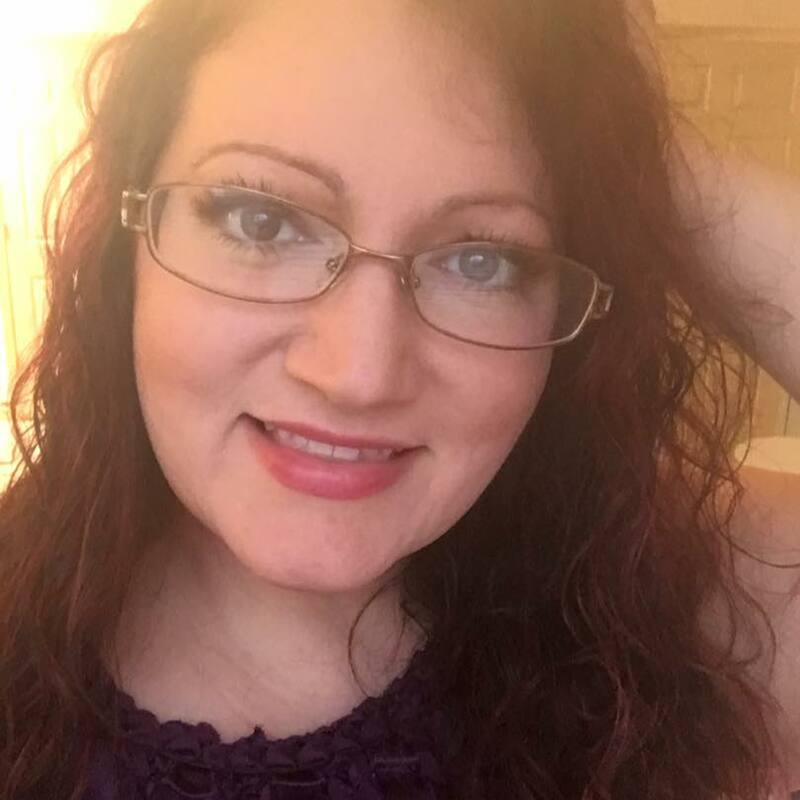 Read up on the author of the book, learning their back-story, date it was written, setting, purpose, etc. A = Assess. Mull over what you are reading, taking time to think about each word or phrases of words. What is God trying to say? What do the words mean? What do they mean to you and your life? What is the author trying to tell the audience? How does it make you feel? I = Investigate. What are the key words or phrases in the passage of scripture you are reading? Look them up in the Greek or Hebrew version to find an in-depth translation or the original meaning. Look up words when you may not fully understand their complete meaning. Investigate how the culture and traditions were lived out in that time setting. Ask questions and seek answers. S = Submit. Submit to the Word of God. Submit your thoughts, heart, ways of life, tongue, sin – all of you – with complete surrender. Having a submissive heart is a choice. Allowing the Holy Spirit to mold you into the image of Christ. Not just taking in one part of scripture, but allowing the complete Word of God to be your life book. E = Express. Live out what you learn. Everyday. Allow God’s Word to renew your mind. Washing you. Retoreing you. Healing you. Be bold for Christ. Let your light shine. Be the salt of the whole earth. Express to the world around you that Jesus is the King of Kings and that He stands, waiting for us, drawing us near to Him. Daily let your lives express that God lives within you. Share your knowledge with others. 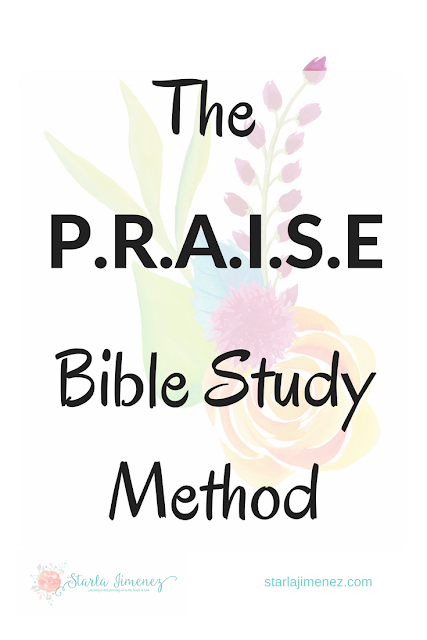 My sincere hope is that this method, the Praise Bible Study Method, will help you dive in with passion, interest and surrender to God’s word. Please enjoy these free printable bookmarks (they are big!) to help your remember this Bible study method. God wants you. All of you. He is your Heavenly Father that waits with arms wide open. Are there rules? Yes. Yet, they have been put in place to protect us. He is Holy. Let’s stand in awe of Him and the love He has for us. 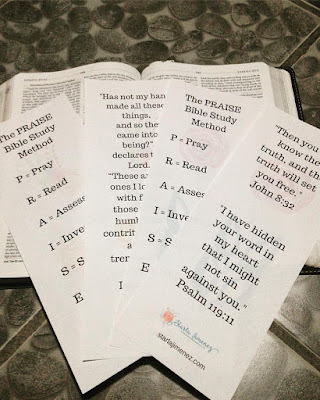 What Bible study method do you use? I like your study method. I usually pray, read the passage and commentaries, ponder over them and pray again. That is a beautiful way to remember. Great job on your list! Thank you for this great resource! I have a really great bible, my next goal is to get a journaling bible! I really have no bible study method, I just read and pray. I also have the Bible App on my phone which has a lot of great devotionals! I love this! Thank you for sharing! I love the printable! This sounds like a great way to study the Bible and I like the focus not just on understanding it but also on living it out. I totally agree with your comment that we should go through whole books of the Bible. That has definitely helped me understand a lot better. What a neat idea! I went to a Christian ladies' meeting last night and the speaker talked about studying God's word intentionally, not just casually. This is really interesting. Thanks for sharing! I like this method. Sounds like a wake-up call!